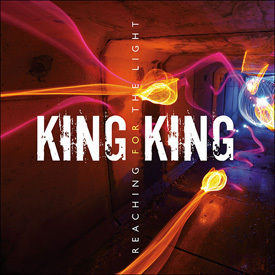 It’s been a long two years since King King released their blistering second album Standing in the Shadows; and their return is especially well timed as their blend of Classic footstompin’ electric Blues is becoming as popular today as in the heady days of my youth in the mid 1970’s. The band immediately throw down a marker with opening track Hurricane which is a pumping force of nature that allows singer/guitarist Alan Nimmo to blow any cobwebs from your speakers and your ears; as the rest of the band sound as tight as a second skin. This is followed by a beautiful song called You Stopped the Rain, which in lesser hands could have become a Power Ballad; but the curve ball here is that the song was written for Nimmo’s brother Stevie when he had throat cancer some years ago; making the words even more poignant. While their previous albums have been pretty straight up Blues-Rock, and Reaching For the Light certainly tips it’s hat in the direction of Free and Bad Company; as Nimmo sounds uncannily like Paul Rogers at times and his diesel powered guitar playing is reminiscent of the massively under rated Paul Kossoff; but several songs also have a funky thread weaving through them; most noticeably the ‘heaviest’ song here, Crazy when Nimmo must have been eating red hot chili’s to get some of the sounds he creates in these four and a half minutes. I absolutely love the crunchily potent Rush Hour and just to prove the band can also slow things down with the ‘wistful’ Lay with Me; and both songs would be perfect for not just Digital Rock Radio, but National radio too. All of the songs here are written by the band themselves apart from a Paul Carrick/Charlie Dore song, Just a Little Lie which features Fridzema playing Hammond Organ that wouldn’t have been out of place on a Stax recording; and the finished article is my favourite track here. Credit must go to Nimmo and drummer Wayne Procter’s production as the sound the band creates is impeccable throughout and never ever comes close to becoming an out and out Rock record; with Nimmo’s singing and guitar playing never sounding better alongside Bob Fridzema’s magnificent keyboards and both are supported by a powerhouse rhythm section in Wayne Procter and Lindsay Coulson on drums and bass. 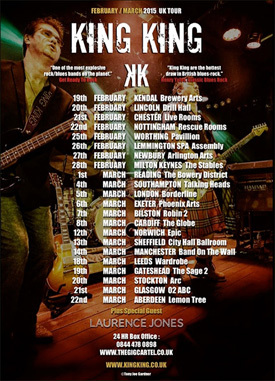 King King have taken all of their teenage influences, then peeled away everything they deemed surplus and added more than a dash of their own vitality and energy to create an instantly regognisable and commercial Bluesy sound just perfect for the sweaty days of Summer.